I like nail polish, a lot. It's one of the few things in the makeup aisle for which I have any patience. What's not to like? There is an abundance of colors available, including a whole palette of purples alone. There are sparklies, which meet my desire for shinies happily. Of all the possible vices on sale at Walgreens, they will last the longest for the price and not boost my blood sugar or be too salty, and when I use it, it lasts for a few days, and I don't feel uncomfortable or itchy the way I do with facepaint. The only downside is that nail polish does take a lot of time, between buffing the nails, applying the polish, and sitting around without doing anything while it dries. I just don't think to take that time, and the upshot of this is that I've got a whole bunch of colors that I've never even worn. At my current rate, I have more than I will wear if I live to be 90. Then a few weeks ago, my friend Kimari was showing off her Muppet glitter polish, and I felt inspired to start doing mine again. The goal is to wear every shade at least once! I may even get rid of some, since I have some that may not be good any more - how would I know? The best way I can think of to do it is to write my impressions as I wear them. I'm not sure how long I'll be able to keep it up, but it's a New Year's resolutiony thing for me, so here goes. In January, I've worn three very different colors. 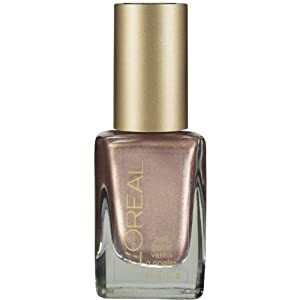 I bought this to wear the same day, to combat winter blues with its mix of big glitter mixed in with the superfine glitter you most often see in nail polish. It really worked! It made me very happy to be looking at purple shinies. This was the best I could do for a good closeup (I figured out once I uploaded these pics that my phone was trying to focus on the paper in the background. Silly phone!). Look how huge the glitter is, seriously! 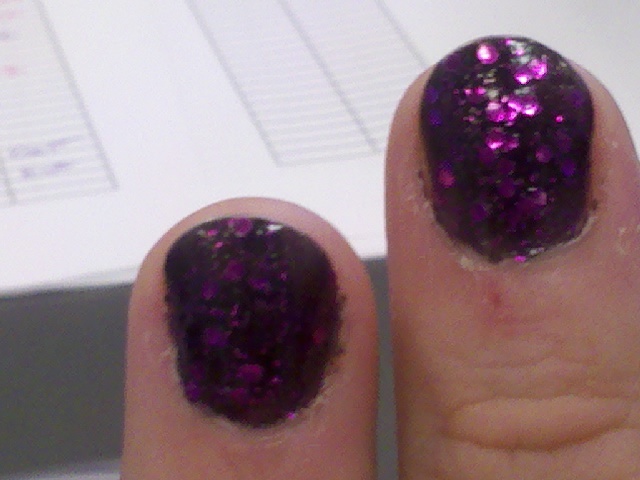 This color held up amazingly, and the huge glitter was the eventual downfall. Several that had ended up near the tips of my nails came off, leaving me with hexagonal bare spaces, which is what led me to change colors. I really like the Sinful Colors line; though I think the idea of colors BEING sinful is laughable, they have a great array of fun colors, and the polish has good staying power. 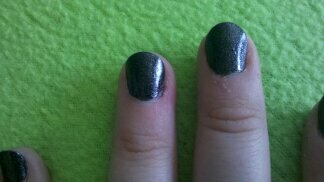 This one is really striking - the base is actually black but it's got such a large amount of glitter in it that my eyes translate it as somewhere between gray and gunmetal, depending on the light. The polish held up well to my day-to-day activities, though there was no heavy-duty cleaning against which to test it. It did chip eventually, after a few days, but it also took repair really well - a lot of colors look really obvious when you try to fill in a chip. I only took it off because I had an interview for a different position at work. I bought this one on Wednesday night. It should be the last one I purchase until I finish this project - no more new polish is part of the deal; I had decided that I should not buy any more after the Scandalous. I made this exception because I specifically wanted something to go with my interview outfit and didn't have any brown tones. This is a lot more, hm, mainstream a color than most of the ones I have. I tend to express all my bright color desires in nail polish and socks. I was looking for something to match a brown jumper, and the girl at Walgreens suggested this. I decided it was perfect. I bought mousse to control my bangs, too, which I may never use again. It was a weird shopping day for me. 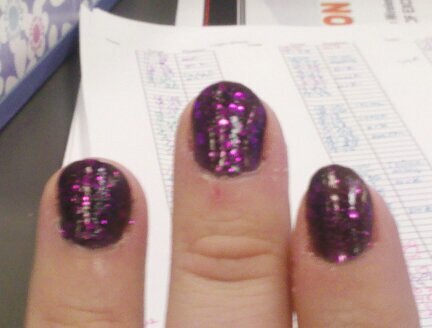 That's the polish against the outfit. It goes really well with that brown, but it is such a pale pale brown that it can also be interpreted as pink. It really did what I wanted. It has also held up unreasonably well, not really beginning to chip until after handwashing dishes yesterday and today, and washing the whole kitchen floor by hand. Didn't use a basecoat on this one. As a polish nerd myself, I was pleased by this. Rawk. I would read one from you if you did one like this. I hope I can sustain it for a while, it was pretty fun. 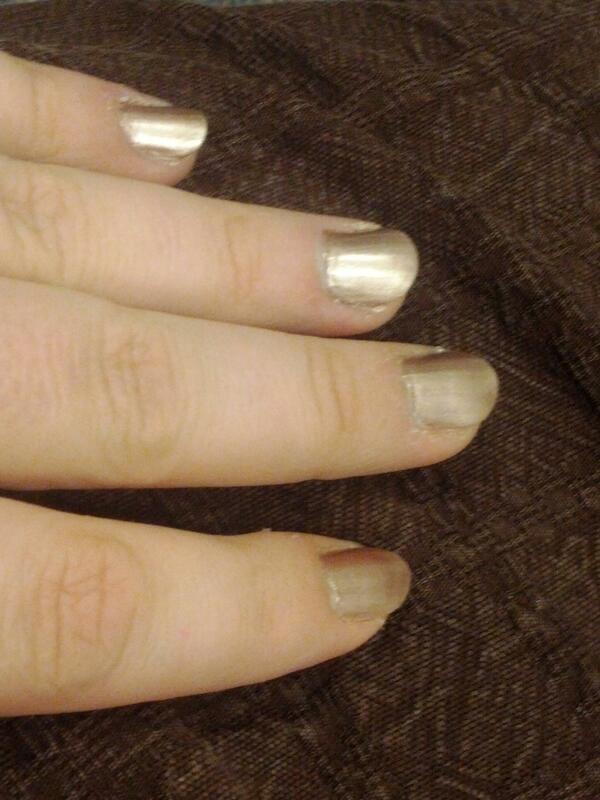 OOooh, shiny :) I like to play with nail colors and glitter! We need more shiny in our lives! Come to the sparkly side! We have glitter!